When you’re a pedestrian, you’re significantly more vulnerable to severe personal injury if you’re in an accident with a vehicle. When you’re walking for leisure, running or jogging, or even just crossing the street, you are trusting that the drivers around you are aware of their surroundings and being cautious around you. 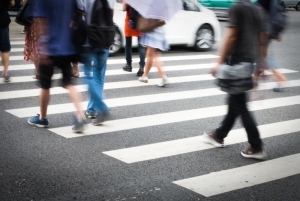 Unfortunately, however, there are many instances of drivers being careless and striking a pedestrian, causing the victim tremendous personal injury or even death. At the Kelleher Firm, we understand how devastating it can be if you’re involved in a motor vehicle accident as a pedestrian. Beyond enduring serious pain and suffering, you may have to deal with exorbitant medical and rehabilitation bills and even permanent disability that can negatively affect the lives of you and your family for years to come. Our experienced pedestrian accident lawyers are here to help you during this difficult time and fight for the fair and just compensation you deserve to get your life back on track. If you or someone you love has suffered serious injury while involved in an accident as a pedestrian, please contact us today by filling out the form on this page or by calling us at 833-546-3675 to schedule your free consultation today. We proudly provide aggressive and professional representation to those who live in and near the Naples, Fort Myers, Cape Coral, areas of southwest Florida. If you’re struck by a motor vehicle as a pedestrian the effects can be traumatic. While you can take every precaution necessary while walking or jogging, the fact of the matter is that if a driver acts negligently or carelessly while they drive you can still be hit. The impact from a 2,000 lbs. vehicle, even driving at a slow speed, can cause tremendous physical damage to your body. We also have experience helping those who lost family members because of a pedestrian accident. In cases of wrongful death, we can help you hold the responsible party liable while seeking compensation for your family’s loss. Pedestrian accidents are not exclusively caused by personal vehicles, as one can be hit by a commercial truck, city bus, or even taxis. No matter what type of vehicle caused the accident, our experienced lawyers can make sure that the liable party is held responsible for their actions. Hiring an experienced attorney is doubly crucial if the accident was caused by a bus, commercial vehicle, or taxi as many considerations must be handled when dealing with a local government or business. As we mentioned above, the injuries and consequences you can face after being hit by a vehicle can dramatically change your life in negative ways. One of the most important reasons to hire an experienced pedestrian accident lawyer is so we can seek the maximum compensation you deserve for your damages. You should not have to go through this trying time alone. Insurance companies are often only concerned with their bottom line and are not looking to give you more than the minimum. Our attorneys understand how the insurance companies work and fight on your behalf to get the compensation you are entitled to. If you or someone you love has recently suffered injury as a pedestrian because of a driver’s negligence, please call the Kelleher Firm, P.A., today at 833-546-3675 or contact us online to schedule your free consultation. We are committed to helping you receive the justice and compensation you deserve during this difficult time. We proudly provide services to those who live in Naples, Fort Myers, and surrounding areas in Florida.